The weather yesterday was upwards of 35 C, about the level when mint julep was typically served in the old South, the “cordial” as it was called then. Many odd customs attended its preparation and serving. One was to present it to the house at sunrise. This is one of those practices which convince you the past truly is a foreign nation, it’s akin to reading about soothing cholic in babies with teaspoons of bourbon. All this and more is attested in a vibrant article by Martha McCulloch Williams in the Topeka State Journal of January 31, 1914. Harking back to mint julep, I wish my critic might have the luck once to see and smell and sip juleps such as were served to us upon rising at the most hospitable house in hospitable Robertson county. Mint for them grew in very rich soil, partly shaded; thus it sprang quickly, almost magially, but was never coarse. It was cut at dawn in midsummer, drenched with dew, snipped off at three inches or less, and set dew-gemmed around the goblet edges, half sunk in sugared water and broken ice. Washing would have been profanation; it had grown too quickly to have even a trace of dust. After it was duly placed the whisky was poured very gently, very steadily, until it stood level with the rim. Such whisky! Robertson county’s best! Wilson Pitt was a favorite brand, so was Silver Spring. Made from sound flint corn, after the old honest fashion, aged in wood, colored very faintly by charred barrels, and kept at least four years, it was fit for the gods. “Not a headache in a hogshead of it” unless you overdrank.The pity of it that prohibition has conquered such an Eden! That, however, is beside the mark. Our Juleps came to us about sunrise. A tinkle of ice and spoons outside our doors was a mighty pleasant reveille. One maid fetched the tray of juleps. Behind came another with a bigger tray full of dewy flowers, roses, carnations, heliotrope, scented and scarlet geraniums. It was the law of the house that you came to breakfast beautifully, with flowers in your hair, at your throat, in your belt; thus only were you in harmony with a table heaped high with dew-wet blossoms all down its length. Who was this extraordinary woman of the Wilsonian era? Williams was a food and domestic writer, and probably a working journalist. She authored amongst other books, Dishes and Beverages Of The Old South. Rather oddly, she declares in this book to be an “ardent” follower of Temperance (page 12) but insists on including recipes for drinks and where whiskey is used as an ingredient. Her detailed mint julep recipe appears at pg. 39. I can’t account for the contradiction. Maybe she told a white lie in the book to encourage sales amongst its presumed market (women, then generally against drink), or meant to profess Temperance ironically. Anyway she seemed someone of unusual spirit for the time, and her encomium on the julep is engaging and well-written. It presages the kind of food journalism and writing now quite common. First, it tells us a bit about Tennessee’s Robertson County’s famous whiskey, of which I wrote earlier. Despite that it was aged four years, the whiskey only had a “very faint” tint from the wood. This seems hard to parse. Four years for any straight whiskey usually imparts a decided brown-to-red, think for example of Maker’s Mark or Jim Beam. It might be that the producers she mentioned, who indeed were famous for quality, selected whiskey from a part of the warehouse where it matured slowly and took only a little colour from the wood. I’ve seen images in fact of old Tennessee brands which were only light yellow, so that may tie in. Or, the barrel may have been charred in a way to minimize extraction of colour. Today, we tend to think of dark whiskey as the best. In a former time, deep colour was not always preferred. For example, pale brandy (Cognac) and dark brandy were marketed as separate items in the 1800s. Given that Roberston County whiskey underwent the charcoal leaching process just as Jack Daniel’s did, it makes sense to me some distillers sold the whiskey only with a light hue. They may have meant the subsequent aging to be restrained so as not to leach remaining character from the whiskey. The other striking thing from Williams’ article: mint juleps were served at breakfast. Indeed it was an old southern custom, now obsolete one might say. Many things do sound odd from the past, although I suppose they would regard some things we do with consternation. Reading how William’s ideal julep was constructed, it makes me think how hard it would be to emulate. Not because of the whiskey – many types could be chosen and indeed many craft distillations would be ideal – but how to get that mint? It was grown outdoors in a hot climate, harvested quickly so nature’s dust hadn’t time to settle, and used within an hour of being cut. I guess if any time is apt to find the mint, it is now with the Southern-like heat and the market gardens in full swing. If you find the mint, let me know. I’ll bring the whiskey. (Read the rest of William’s article via the link given, it is very interesting and she drops the name of O. Henry amongst other tidbits). 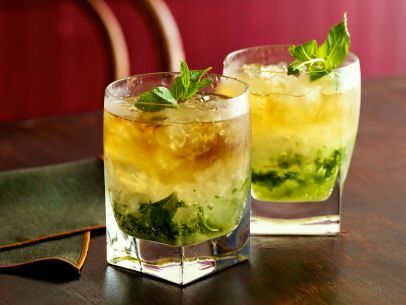 Note re image: the image of the mint julep was sourced from the Food Network site, here. Alton Brown’s recipe given there is highly recommended. Image believed available for educational and historical purposes. All feedback welcomed. But my candidate for the most transcendent mint julep ever served is this one. What fun it would have been to be a fly on that wall… Hell, I want a straw in that julep! And Dickens, one of the great drinkers of all time. He had a fantastic cellar for the time, replete with all the great French libations and Scottish malt whisky too. He clearly enjoyed himself in America, taking several extended tours here. Nice to hear from you, that’s wonderful, thanks so much! Bring it over! — we have the mint. It’s easy to grow in Massachusetts. We have it in our backyard and it is a great ingredient for all sorts of things. It survives the winter here. I’m sure it would do well in a flower pot too. Thanks Jan, but hey give the drink a try, see if it’s as good as she said. The mint you have sounds like it would work well.